That hit me bad. Flabbergasted I took a deep breath to think it over. Then I told her she of all people shouldn’t be so superficially judgmental and if I see some point by way of food for thought, it is just that, maybe I’m not so good at camouflaging words like most folk are. As for being a closet Hindutva, please, I’m a Hindu only by some stray conviction and I am not a terribly pious Hindu at that. I believe everything is here, now, today. I’ve become choosy and pick up whatever I like from all religions – be they Hinduism, Islam, Christianity, Buddhism. In fact I love the philosophy of Nichiren Daishonin’s Buddhism the most, and try constantly to live and abide by it in whatever ways I can. The hubby is an avowed atheist and laughs at me. Also, I do believe that it always harder to say nasty things, easier to praise, lick boots and scratch backs! The gutsiest people stand up for their convictions and these come in black and white and not 60 shades of moveable grey. Look at Goa, nobody wants to be in the Opposition, not even the worthy members who’ve come to power on a Congress ticket. Without a sharp and focused Opposition in a democracy, the government degenerates into anarchy and “tyranno-cracy (to coin a word) and we are seeing this all around us. Let’s say in my family of two I’m the Opposition at home because I care and do love and respect the hubby who in fact, is far more sensitive than I am. I mean he could be all the Hindu, Christian, Muslim and Buddhist Gods rolled in one for me in this life time and even if I say nasty things they are without malice. That’s what you think! Sniffed this paragon of virtue of a friend of mine. Maybe she is right, but right about what? Oh well, maybe henceforth I shall refrain from any “husband-bashing” in this column except that I don’t think that’s what it is. Maybe I’m trying to get him to see life through a different perspective by saying nasty things. When something stings or pinches most of us sit up and think it over, no? Providing we’re not thick-skinned and that he is not! TO get back to foodie talk of a different kind, it was a birthday bash and I went out for dinner with my friend Nandita Haksar. 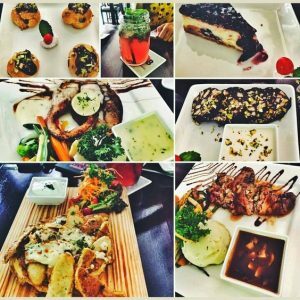 She’s a real meaty gourmet and looks for far more professionally and honestly served meals than I do – since everybody thinks food is the best business to go into we decided to go check out this upmarket place called Barrels & Bones which some of our common friends were raving about. Why Barrels & Bones? It’s a BBQ steak house becoming popular. They indoors room setting is reclusive unless it’s packed to the gills and then noisy chatter fills the room, since we Indians do not how to do conversation in soft tones or notes! 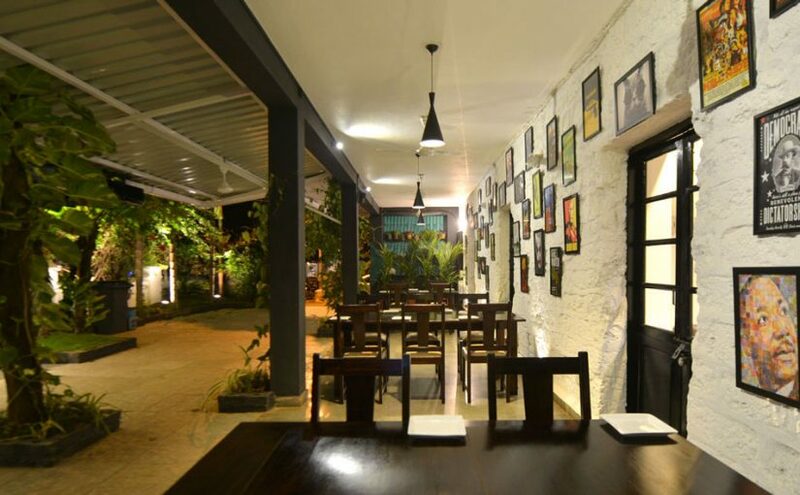 The menu is grand and one may order some choice appetizers, breads, dips, salads, pastas, grills, seafood, chicken section, and for the veggies… cauliflower au gratin (`350), cottage cheese farcito, aubergine parmesan, etc. There are sizzlers, risottos, pizzas (wood-fired) and weird desserts of chocolate salami and chocolate budino, orange zest cake, and a choice of ice-creams. I was getting interested in baby spinach, button mushrooms, arugula and garlic dust pizza (`450) when the friends changed my mind. They said try the seasonal grilled fish marinated with rosemary olive oil, orange zest and lemon butter served with cauliflower puree and grilled vegetables (`650). It was so-so and I wished I’d ordered something else! The Kingfish steak which came was dry and chewy, the listed cauliflower puree was not cauliflower puree but potato puree, and where was orange zest? Why promise something and deliver something else without informing or even apology? Such highly priced fine dining must come with professional honesty and attitude. I mean potato puree or mashed potato is not cauliflower puree! But the lemon garlic butter was rich and nice and I loved it. I liked the assorted jacket potatoes with mushroom and cheddar, but then I’ve always liked jacket potatoes cooked in a wood ash fire, tandoor, or in an oven and drizzled with lemon garlic butter or the French garlic aioli. Nowadays someone’s marketing a slew of mayos – spicy jalapeno mayo, black olives and onion mayo, lemon mayo, wasabi mayo, anything mayo! Fresh sauces, salsas, chutneys, relishes…kimchi, sauerkraut or Japanese-styled pink vinegary ginger, or onion, are preferable. I DON’T know why watermelon, feta and mint tossed salad should be so pricy. At `300 it’s ridiculous, considering only small portions of the more expensive feta or mint is used in the salad. It’s mean to compromise on the most expensive item number. For instance I recently ate a salad somewhere which featured black olives, but there must have been only one black olive sliced fine and tossed in. At last make it half-a-dozen olives black and green for the price listed! This is to say if you don’t want to suffer from cardiovascular disease eat more green for fiber, folic acid and all good things! Cut the salt to a minimum because that is what hardens and pickles arteries. I WONDER if anyone could make a fortune serving only salads. They could call themselves ‘Only Salads’ and offer the grandest mix of greens, berries fresh or refreshed, with nuts of all kinds. If imaginatively and not too exorbitantly priced, all health-conscious Goa would flock there or would they? I wouldn’t mind one bit if all the alcohol bars shutting shop turned over a new leaf and became health-conscious fruit/veggie juice and salad bars, but I dare say that would be taking a risk. Goans are not ready to entertain health-consciousness from A to Z or something like that. By and large most of us don’t eat to live, but live to eat. Look at me, a true blue foodoholic! I know it all in theory but in practice I go for a toss every so often. It’s something to do with feeling more at home outdoors than indoors. That’s what I always say. I’m happiest ensconced on a bench in some garden munching on a sandwich – say a genuine starter-leavened, an old-fashioned oven-baked whole meal bread sandwich, packed with either lashings of green mint chutney or maybe a wee bit of fresh green mango pickle smothered with natural cheddar. Check it out, it’s yum. The pickle must have a hint of mustard oil about it! THAT’S all for now. Keep watching this space. I’m still not buying mangoes because their price hasn’t come down to the level of imported apples from New Zealand (`160-`180 per kg), You are paying `60 per single Goan mancurad? Shame on you!